Hours: Mon-Tue, Thu-Fri 6 a.m. to 7 p.m.; Wed 6 a.m. to 6:30 p.m.; Sat 6 a.m. to 3 p.m.
At this risk of sounding overly dramatic or harsh, Jack’s BBQ is emblematic of what is wrong with North Carolina’s dying barbecue culture. It’s a charming and cozy little joint, complete with about a half dozen booths and an old fashioned (and just plain old, as Jack’s dates back 43 years) counter, plus a carry-out window. The service is efficient and the staff couldn’t be nicer. The customers look happy. And so on. But the barbecue is terrible. If the place was called Jack’s Cafe, I’d be nice and leave them alone. Hell, I’d even return for another (BBQ-free) meal. Instead, I have to be honest and mean. Probably every barbecue lover has been faced with this dilemma: It’s Sunday and the hankering for barbecue strikes, but all the good local joints are closed. Do you a) go against your primal instinct to hunt ‘cue and eat something else, b) go to a second rate joint to get your fix, or c) drive the 1.5 hours required to reach a good joint open on Sundays? Unfortunately, I chose option b) a couple weeks ago and got just what I deserved from the Q Shack, a lousy meal. My wife, Mrs. LeSwine, and I had a friend in town and she wanted to eat some ‘cue before heading home the next morning. Instead of just explaining that the few good joints in the Triangle are closed Sundays, we decided to try out the Carrboro Q Shack (complete with its too-clever motto, “BBQ Tender as a Mother’s Love”). Slick corporate propaganda: a funny sign but not a good sign. How Sweet It Is To Be Loved By ‘Cue? Bob’s Bar-B-Q is a nice enough place with a large, lodge-like atmosphere and an authentically old fashioned feel. The comfortable feel is helped by the friendly staff who greet customers as they step into the cafeteria-style serving line. But alas, the ‘cue doesn’t come close to matching the sweet staff. Unfortunately, the staff isn’t the only thing at Bob’s that is sweet. This is one of the only barbecue joints I’ve ever been to where the barbecue has a sugary taste without any sauce added. Frankly, it’s distressing. The barbecue had a good, rough-chopped consistency but its wood smoke-free and oddly sweet taste was not helped by the steam table from which it was served. The fiery hot Eastern style sauce at the table was quite good, and reminiscent of Scott’s famous recipe, but could not save the pork from mediocrity. 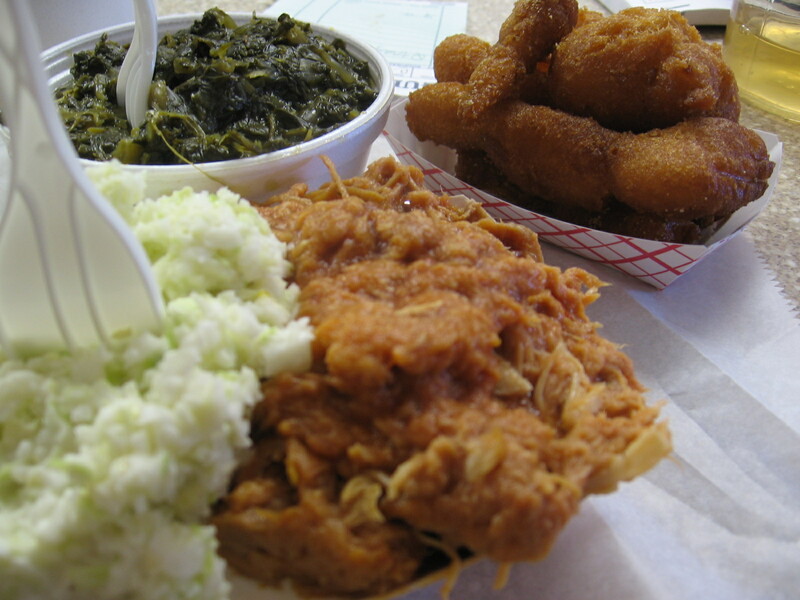 For what it’s worth, the meat is reported to be pork shoulders (a Lexington-style trait), while the sauce and the sides served at Bob’s are very much in the Eastern tradition. Cross-breeding of this sort is more common than most people think, especially in and around the Triangle area. The barbecue plate I ordered was accompanied by (surprise) very sweet, very finely chopped slaw made with lots of relish. The Brunswick stew, which I’ve heard some folks rave about, struck me as a bit (yes) sweet, watery and low in flavor. The hush puppies were not overly sweet, but were dry and chewy, again likely from the steam table (steam tables are brutal on hush puppies, in my experience). The rest of the menu, which I did not sample, included chicken and a variety of lunch grill items (hot dogs, grilled cheese, fish sandwich, etc.) with rotating specials like chicken and dumplings. The pies looked good, especially the pecan, but I had already ingested enough sugar from the BBQ so I steered clear. The hot light's on, but you can drive past. Based on my limited experience eating barbecue at or near the beach, I think the best advice I can provide for such situations is not to indulge. Perhaps it’s the over-supply of sunshine and sand, the undersupply of hickory, or the BBQ joint owners having mercury poisoning from all the nearby shellfish, but for some reason beach BBQ joints rarely offer ‘cue worth eating. A & G Bar-B-Que & Chicken, located on the main drag just off the waterfront in Carolina Beach and featuring a generous two ampersands in its name, does nothing to change my mind about beach ‘cue. That’s the bad news. The good news is that next time you are in Carolina Beach you can skip the ‘cue and have plenty of room for donuts from Britt’s, which vies for the title of Best Donut Shop in America, in my opinion. More on that later.